I'm really enjoying this Diana-centric episode in the "Keeper" series so far. I'm almost done, and am quite content to take my time - so that I don't pine away for a fourth one. So, what do you do when you're a Keeper who is just graduating High School? You're one of a valiant few who can alter reality and make sure that the various other worlds don't intrude on Earth too much. You keep mystical forces in balance. You have a talking former-angel, now-feline sidekick, and the whole world is opening up for you. Well, you go save the world, of course. But when you're a young lesbian Keeper and the Otherside has decided to take an entire suburban mall and cram it full of evil, things might get a little out of control. 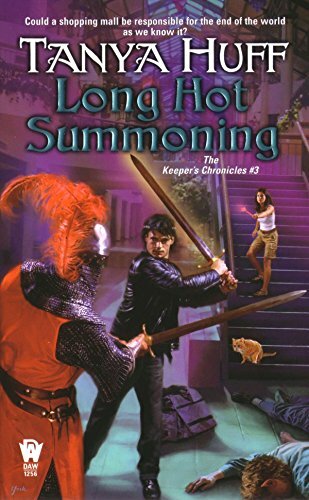 Especially with the forces of good being made up mostly of runaway street teens who are turning into Mall-Elves, and being led by an Archetypal King Arthur (with boy-band looks and a leather ensemble). Definitely bring the cat. This is the third in the "Keeper" series by Tanya Huff, and it's a blast. Diana, the heroine, just blasts out contemporary sarcasm throughout the tale, and as usual, the humour and punny nature of Evil is just a joy to read. You'll laugh, you'll cry, you'll wish you too could find a saucy leather-clad Mall Elf.